In November 2010, the California Department of Consumer Affairs (DCA) finally decided to act responsibly and forbid the prevalent practice of Chinese bloodletting by licensed acupuncturists. The practice became a concern for the DCA when allegations of unsanitary bloodletting at a California (CA) acupuncture school surfaced. The incident allegedly occurred during a “doctoral” course for licensed practitioners. The instructor was reportedly demonstrating advanced needling and bloodletting techniques. During the process, he took an arrow-like lancing instrument that is called a “three-edged needle” (三棱针), sharpened it with sandpaper, cleaned it with alcohol, and then asked a student-volunteer to roll a towel around his neck (similar to what is depicted in Image 1). The instructor then cleaned the student’s temporal region with alcohol, and punctured a superficial blood vessel with the arrow-like instrument. The student then held his head over the garbage can, gushing blood for a while. 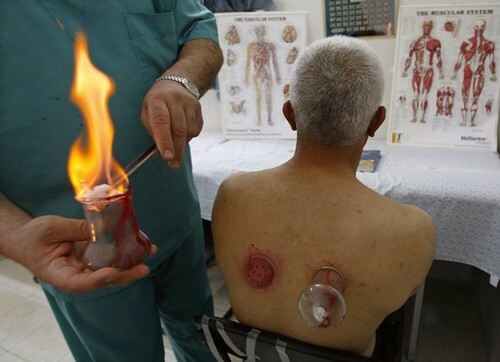 The ancient practice of bloodletting, with or without cupping, is still widely used in Chinese medicine to remove “stagnant blood, expel heat, treat high fever, loss of consciousness, convulsion, and pain.”1 The amount of blood let depends on the condition, and the location of the incision. A contemporary book recommends letting a tiny amount from a point adjacent to the thumbnail for a condition described as “wind-heat invasion” of the lung. The symptoms associated with this unscientific nomenclature include chills and fever, sore throat, stuffy or runny nose, and a yellow discharge,2 which could correspond to many respiratory conditions, including the common cold, influenza, pneumonia, etc. As several posts on the Science-Based Medicine website have indicated, bloodletting is not uniquely Far-Eastern, and has been practiced throughout the world since antiquity. Muslims still practice a version of it (known as Al-hijamah, الحجامة) for indications similar to those of the Chinese (Images 3 & 4). Images 3 & 4. A practitioner of al-hijamah bleeds a patient at his clinic in the West Bank. Image source: Reuters/Nayef Hashlamoun (West Bank Health). August 2009. The Acupuncture Board of CA, which falls under the DCA, has come under criticism for being made up of trade insiders and affiliates of acupuncture schools, and–most importantly–for failing to protect the public from quacks and charlatans. In the past, members have even been investigated for taking bribes and selling licensing exam answers. The Board was replaced recently in an attempt to clean up the quasi-anarchic and corrupt licensing and practice of Chinese medicine in CA. It appears that now the DCA is taking public health seriously, and is cleaning up the profession, one calamity at a time. 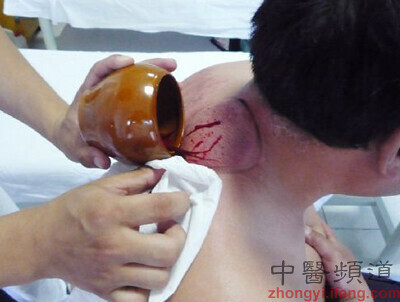 This time it reined in the practice of Chinese bloodletting. Hopefully we will not need another gruesome or dreadful event for a “consumer protection agency,” such as the DCA, to also realize that beneath the absurdity of these medieval treatments, resides the immanent danger of un- and misdiagnosis of conditions that need real medical attention. 1. 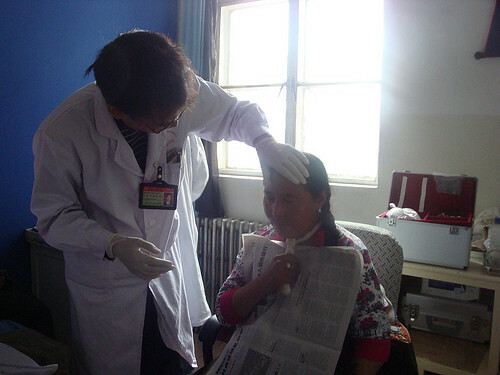 State Administration of Traditional Chinese Medicine and Pharmacy. Advanced Textbook on Traditional Chinese Medicine and Pharmacology. Volume IV. New World Press, Beijing. 1997. 2. Maciocia G. The Practice of Chinese Medicine: The Treatment of Diseases with Acupuncture and Chinese Herbs. Churchill Livingstone; 1 edition. 1994. 3. Seigworth GR. Bloodletting over the centuries. NY State J Med. 1980 Dec;80(13):2022-8.